Chipotle was one of four stocks that Einhorn discussed during his presentation at the Value Investing Congress in New York. He also spelled out a case for why investors should buy General Motors (GM) and health insurer Cigna (CI). And he reiterated his case for shorting Green Mountain Coffee Roasters (GMCR). Still, since Einhorn has been deemed prophetic for his short calls (Lehman Brothers), his call on Chipotle drew the biggest response from investors. Within moments of mentioning Chipotle, the casual Mexican restaurant company's stock dropped more than 6%, eroding nearly $1 billion in value. Chipotle's shares dropped immediately after hedge fund manager David Einhorn started talking about the company's potential problems. The Einhorn effect was less pronounced with GM and Cigna, which both popped more than 1%. Green Mountain Coffee Roasters initially dropped but eventually traded up more than 1%, despite Einhorn's continued questioning of their accounting and capital spending. Greenlight's primary fund has generated returns of 13.5% this year and was up 2.5% in September, according to an investor with knowledge of the fund's returns. A Greenlight Capital spokesperson declined to comment. During the question and answer session, Einhorn said his fund is up in the "low teens" this year and generated low single-digit returns last year. While Einhorn's calls to short a company's stock are often predicated on questionable accounting tactics, in the case of Chipotle, he said that's not the issue. The Mexican grill's issues are simply that it will lose its hungry user base to those who will switch to Taco Bell's new, slightly cheaper menu. Einhorn also said that the market's been overvaluing the stock. Although the stock was already down for the year before Einhorn's presentation, Chipotle shares have more than doubled over the past five years. On General Motors, he said that investors have followed the guilty til proven innocent mentality since the government's takeover. Post-bankruptcy, Einhorn said the company is much healthier and is no longer saddled with unsustainable health care costs for retirees. And despite having $81 billion in unfunded pension obligations remaining, Einhorn said GM won't have to put more money into those pensions until 2019 or 2020. The company, he said, is well poised to gain market share, particularly internationally in China and South America, with its existing slate of vehicles, but it could also do much better with better cars. Most importantly, he said GM can simply return some of its $38 billion of cash to shareholders or buy back shares, regardless of whether the U.S. government decides to sell its 27% stake. 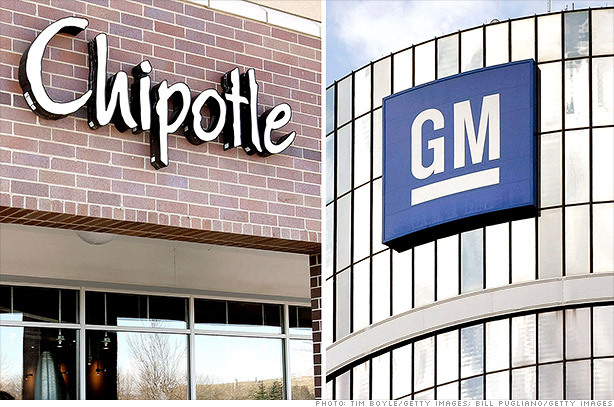 Beyond GM and Chipotle, he said investors also remain wary of health insurance firms, specifically HMOs. Einhorn said he sees health insurers as isolated from the macroeconomic risks because people will always get sick. Secondly, the government is now forcing companies and individuals to buy health insurance. Einhorn said all health insurers are tempting but he called Cigna the best one of all. Einhorn kicked off his presentation by acknowledging the effect his presentations have on stocks, but said investors and analysts need to do their own research. He mocked investors who blindly followed him into a little known ethanol company. In early September, shares of BioFuel Energy (BIOF) tripled on media reports that Einhorn had increased his stake. As CNNMoney previously reported, Einhorn only acquired the new shares because of a prior agreement with the company. Since CNNMoney's September 17 article, BioFuel's shares have dropped down 45%. "I'm often wrong," he said. "If you can find out when that is, there's money to be made on the other side."